My Hiroshima and Miyajima itineraries are carefully designed so that you can see the most important sights efficiently and comfortably, whether you go as a daytrip from Osaka/Kyoto, or stay overnight in Hiroshima or Miyajima. Hiroshima is only 1 hour and 42 minutes from Kyoto by the fastest shinkansen (bullet train). From Osaka, it’s only 1 hour and 33 minutes. So, if you’re short on time, you can actually visit Hiroshima as a daytrip from these cities (do not try it from Tokyo!). 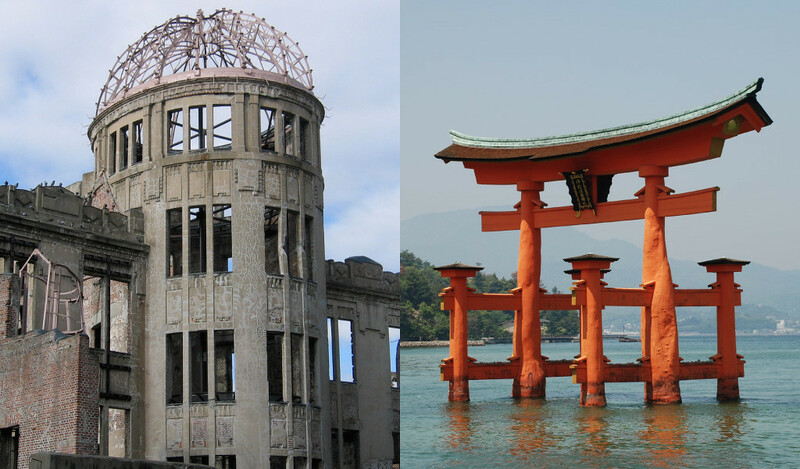 See my Getting to Hiroshima and Miyajima page for details. However, I strongly recommend that you spend a night or two in the area so that you can slow down and soak it all up. Then, your only decisions are: Do you spend one or two nights? And, do you stay in Hiroshima or Miyajima, or one night in each place? Read my suggested itineraries below to help you decide. For information on the sights mention here, see my Things to Do in Hiroshima and Miyajima page. For transport information, including travel between Hiroshima and Miyajima, see my Getting Around Hiroshima-Miyajima page. For restaurant suggestions, see my Best Restaurants in Hiroshima and Miyajima page. For my hotel suggestions, see my Best Hotels in Hiroshima and Miyajima page. If you’re really in hurry but still want to visit Hiroshima, you can definitely do it as a day trip from Kansai (Kyoto, Osaka etc). Note that if you spend one night in Hiroshima before or after doing this itinerary, you’ll find it more relaxing. Assuming you start from Kyoto, a Nozomi shinkansen leaving at around 7:45am will get you to Hiroshima station around 9:15am. You can always buy a bento or pastries at the station to eat on the train. After arriving at Hiroshima Station, grab a map at the Tourist Information Center in the station and maybe a cup of coffee. Then, leave via the south exit and head to the street tram stop in front of the station (make sure you have some change to cover the Y160 fare). Take tram #2 or #6 and get off at Genbaku-domu-mae (A-Bomb Dome) about 10 minutes later. You can easily see the famous Atomic Bomb Dome from where you get off the tram. Take some time to observe this sobering sight, then cross nearby Motoyasu-bashi Bridge across the Motoyasu-gawa River and enter the Peace Memorial Park. I suggest heading straight through the Peace Memorial Park to the Peace Memorial Museum because you want to get there as early as possible to avoid the crowds that descend on the museum as the day progresses. Allow about 90 minutes to explore the museum thoroughly. Leave the museum and walk north, back across the Peace Memorial Park. Your first stop should be the famous Cenotaph for A-Bomb Victims. From there, continue north to the Children’s Peace Memorial. Then, take some time to explore the rest of the Peace Park, allowing time to reflect on what you have seen. I suggest eating a slightly late lunch, so that you can more easily get a seat at local restaurants. There are several restaurants in the neighborhood just across the Motoyasu-gawa River from the Peace Memorial Park. If you don’t find anything to your liking right across the bridge, continue east along that same road (Hon-dori) and you will soon find yourself in Hon-dori Shotengai Shopping Arcade, which is lined with all kinds of good restaurants, including a branch of Otoya. See my Best Restaurants in Hiroshima-Miyajima page for some more picks. After lunch, take a taxi or street tram northeast to Shukkei-in Garden. A taxi will cost about Y1,000. If you take the tram, you can take tram #2 or #6 (or possibly #1, depending upon where you board) to the Hatchobori stop, then take tram #9 north to the Shukkeien-mae stop, from which the garden is a short walk. You can walk from Shukkei-en Garden to Hiroshima Station in about 20 minutes. Alternatively, a taxi will cost around Y600. If you board a Nozomi shinkansen direct to Kyoto, you can be back in time for dinner. This is a six-hour itinerary of Miyajima. You can use it as a stand-along itinerary for the island, or as part of a combined Hiroshima-Miyajima itinerary. Upon arrival on the island, it’s very easy to get oriented. Just walk south along the shoreline in the direction of the famous “floating shrine gate.” Walking from the pier, this means going to your right. Take some time to explore Itsukushima-jinja Shrine and pose for the obligatory photo of yourself with the floating shrine gate in the background. From Itsukushima-jinja, it’s an easy 10-minute walk up to Daisho-in Temple. It’s clearly marked and you can usually just follow the crowds. Take a good hour to explore the temple. Backtrack toward the village and choose a restaurant for lunch. See my Best Restaurants in Hiroshima-Miyajima page for some suggestions. After lunch, follow the small Mitarai-gawa River up into Momiji-dani-koen Park. This is a nice place to relax for a while after lunch. Continue up the valley, following the river, to reach the base station of the Miyajima Ropeway. Take the gondola/cable car up to the top station, near the summit of Mt. Misen. Walk from the top station for about 30 minutes to reach the true summit and check out the temples, shrines and views there. If you’re got the energy and time, I suggest walking down from the summit to the village. From the Niomon Gate down to Daisho-in Temple takes about an hour. If you walk down from Mt. Misen at a leisurely pace, you’ll be back in the village around 4pm. If you’re staying the night on Miyajima, return to your lodgings. Otherwise, head to the piers for a ferry back to the mainland (Hiroshima Peace Memorial Park or Miyajima-guchi and on to Hiroshima). Two days is the perfect amount of time to check out Hiroshima and Miyajima. I strongly suggest visiting both places when you come to this part of Japan. If you only visit Hiroshima, you will only have the searing memories of the Peace Memorial Museum. But, the natural beauty and spiritual atmosphere of Miyajima act to settle those memories and give you the energy to process them. If you’re only going to spend one night in this area, you have to decide where to spend the night. If you want a lot of dining options and nightlife, I recommend spending the night in Hiroshima. If you want peace and quite and want to try a ryokan, consider spending the night in Miyajima. Travel from Kyoto or Osaka to Hiroshima by shinkansen and do my Must-See Hiroshima 1-Day Trip Itinerary above. Spend the night at a hotel in Hiroshima. Wake up and travel to Miyajima and do my Must-See 1-Day Miyajima Itinerary above. Try to get an early start so that you can get back to Hiroshima Station in the late afternoon. Then, catch a shinkansen back to Kyoto or Osaka (or further west if you’re going to Kyushu etc). Travel from Kyoto or Osaka to Hiroshima by shinkansen. Change to a local train to Miyajima-guchi Station and take the ferry across to Miyajima. Do my Must-See 1-Day Miyajima Itinerary above. Spend the night on Miyajima. Wake up and head back to Hiroshima. I suggest taking the ferry direct from Miyajima to the Peace Memorial Park. Do my Must-See Hiroshima 1-Day Trip Itinerary above. Consider cutting out Shukei-en Garden if you’re tired. Then, head to Hiroshima Station and catch a shinkansen back to Kyoto or Osaka (or further west if you’re going to Kyushu etc). Three days in the area really gives you time to slow down and also allows you to spend one night in Hiroshima and one night on Miyajima. Wake up and travel to Miyajima and do my Must-See 1-Day Miyajima Itinerary above. Since you’ll spend the night on Miyajima, you can really slow down on the island. Consider leaving Mt. Misen for Day 3. Wake up and take the Miyajima Ropeway up Mt Misen. Explore the top then hike back down to the village. Return by ferry to the mainland and then take a shinkansen back to Kyoto or Osaka (or points west).